Ethel Carrick's depiction of Saint-Malo conveys a moment seized with delightful briskness. She painted it during a trip along the coast of Brittany with her artist-husband E Phillips Fox. Carrick portrays a lively orchestration of visitors to the charming fortified town, as they file between rows of change booths, the small beach shrunken by the encroaching tide. She embraces the colourful array of hats, jackets, dresses and umbrellas worn by the promenading figures shimmering in the sun, immortalising pleasures soon to recede with the advent of war. Signed l.l., oil "CARRICK". Not dated. Georgina Downey, Art, love and life: Ethel Carrick and E Phillips Fox , 'Cosmopolitans and expatriates', pg. 57-65, Brisbane, 2011, 64 (colour illus. ), 90 (colour illus. ), 157. Elizabeth Fortescue, Daily telegraph , 'Gallery works on its 'little masterpiece'', pg. 56, Sydney, 20 Jan 2010, 56. Simon Ives, Look , 'High tide for the Belle Epoque', pg. 15-17, Sydney, Jul 2010, 15 (colour illus., detail), 16 (colour illus., detail), 17 (colour illus.). Barry Pearce, Look , 'Jewel of a painting returns: Out of Australian sight for nearly ninety years', pg. 12-13, Sydney, Mar 2010, 12 (colour illus., detail), 13 (colour illus.). Jill Sykes, Look , 'Worth a second look', Sydney, Aug 2011, 10. Ethel Carrick Fox , Sydney, 1986, 14. The Royal Academy of Arts, 1917 , London, 1917, 28. cat.no. 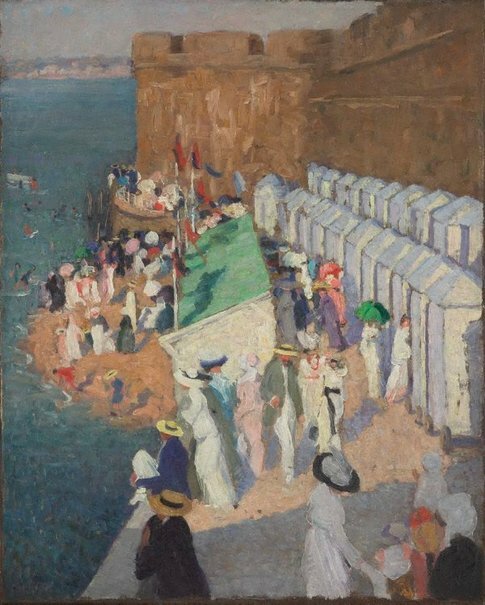 291; titled 'High tide at St. Malo'; Gallery no. V.
Age , 'Art notes: Mrs E. Phillips Fox's pictures', Melbourne, 11 Jul 1913.